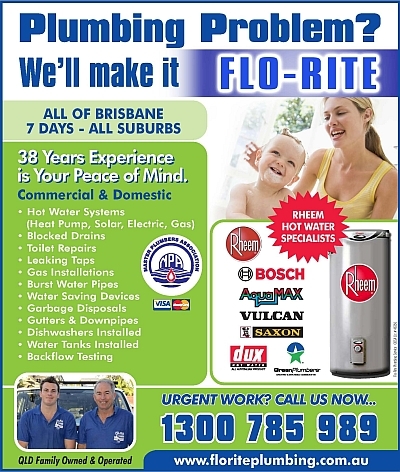 Flo-Rite Plumbing services all of Brisbane City, Northside, Southside, Eastside and Westside suburbs. We offer a 24 hour, 7 days a week plumbing service to Brisbane City and surrounding suburbs in the metropolitan area. If you need plumbing service in Brisbane, all of our trade staff have Plumbing, Drainage, Electrical and Gas Fitting Licences. We service all suburbs with commercial, industrial and residential plumbing and hot water servicing, repairs and new installations. Flo-Rite Plumbing can fix absolutely anything to do with your plumbing, drainage, gas fitting & hot water problems in Brisbane. Our back office team co-ordinate all service calls ensuring repairs or installations are carried out to the highest professional standards. When things go wrong with your taps, toilet or drains, it's good to know that Flo-Rite Plumbing your Plumbers Brisbane service specialist are there to help you no matter how large or small your problem is. All of our trades people are professional employees of the company, we do not out source our work to sub contractors. Our total business is built around servicing you, the customer.